Tibetan mastiff puppies are seen atop a car on a red cloth for sale out side a convention center at Changping, northern suburb of Beijing. A TIBETAN MASTIFF puppy has been sold in China for almost €1.4 million, in what could be the most expensive dog sale ever. A property developer paid 12 million yuan (€1.4 million) for the one-year-old golden-haired mastiff at a “luxury pet” fair Tuesday in the eastern province of Zhejiang, the Qianjiang Evening News reported. “They have lion’s blood and are top-of-the-range mastiff studs,” the dog’s breeder Zhang Gengyun was quoted as telling the paper, adding that another red-haired canine had sold for 6 million yuan. Enormous and sometimes ferocious, with round manes lending them a passing resemblance to lions, Tibetan mastiffs have become a prized status symbol among China’s wealthy, sending prices skyrocketing. The golden-haired animal was 80 centimetres tall, and weighed 90 kilograms (nearly 200 pounds), Zhang said, adding that he was sad to sell the animals. Neither was named in the report. 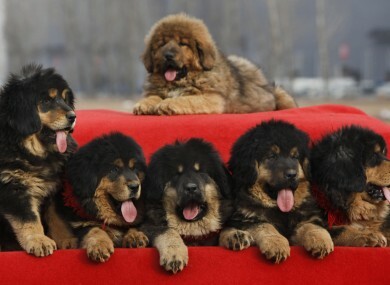 “Pure Tibetan mastiffs are very rare, just like our nationally treasured pandas, so the prices are so high,” he said. One red mastiff named “Big Splash” reportedly sold for 10 million yuan ($1.5 million) in 2011, in the most expensive dog sale then recorded. The buyer at the Zhejiang expo was said to be a 56-year-old property developer from Qingdao who hopes to breed dogs himself, according to the report. The newspaper quoted the owner of a mastiff breeding website as saying that last year one animal sold for 27 million yuan at a fair in Beijing. But an industry insider surnamed Xu told the paper that the high prices may be the result of insider agreements among breeders to boost their dogs’ worth. “A lot of the sky-high priced deals are just breeders hyping each other up, and no money actually changes hands,” Xu said. Owners say the mastiffs, descendants of dogs used for hunting by nomadic tribes in central Asia and Tibet, are fiercely loyal and protective. Is there a camel on the loose in Tallaght? Email “A puppy has been sold in China for €1.4 million”. Feedback on “A puppy has been sold in China for €1.4 million”.